Business minister Baroness Vadera has denied she is out of touch after claiming she could see "a few green shoots" of economic recovery. The Conservatives said the comments, made to ITV News, had been "unbelievably insensitive". The remarks came on a day when UK firms announced large-scale job losses and share prices slumped by almost 5%. But Baroness Vadera defended herself, saying she had been referring to improvements in the credit market. On ITV News, she was asked when the UK could expect to see some "green shoots" amid the economic downturn and replied: "It's a very uncertain world right now globally... I wouldn't want to be the one predicting it." "I am seeing a few green shoots but it's a little bit too early to say exactly how they'd grow." She later told BBC News she was "not complacent at an incredibly difficult time". The minister added she had been "having a discussion about the credit market", where a large company had just raised hundreds of millions of pounds, which was "fresh in my mind". This had been "inconceivable two months ago" and showed there was now some "real lending". She said: "Is this a positive straw in the wind, or should we say one swallow does not make a summer? It's too early to say." On the BBC's Newsnight programme on Wednesday, Business Secretary Lord Mandelson praised Baroness Vadera's work to support business and said he understood what she was talking about in terms of certain positive signals. However, he added: "Do those make green shoots? I suspect not." And pressed on whether Baroness Vadera will use such language again, he replied. "I doubt it". BBC business editor Robert Peston said there were signs in the past few weeks that conditions on the margin in certain money markets "were getting a little bit easier" and that this could be regarded by bankers as "traces of green shoots". "However, it is very early days and only today we saw some of those green shoots vanish," he said. "All over the world stock markets have been falling, particularly the price of shares in banks because there's a growing concern of mounting losses in banks that'll require taxpayers to put even more billions into the banking system. "So right now, even in that narrow banker's sense of green shoots, it is almost impossible to see them." Baroness Vadera's comments came as Barclays announced it was to cut 2,100 UK jobs, Jaguar Land Rover said it was cutting 450 staff and administrators of music chain Zavvi announced it would close a further 18 stores, with the loss of 353 jobs. For the Conservatives, shadow chancellor George Osborne said: "For a Labour minister to be talking about the green shoots of recovery on a day when thousands of people are losing their jobs is not only unbelievably insensitive, but it does beg the question on what planet is this Labour government living? Certainly not Britain in 2009." 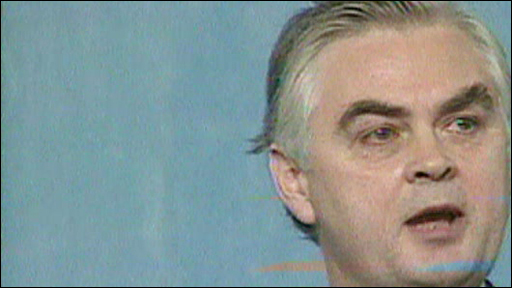 In 1991 the then chancellor Norman Lamont was criticised for saying, during the middle of a recession, that he detected "the green shoots of economic spring". Asked about Baroness Vadera's remarks, the ex-chancellor - now Lord Lamont - said there was always "huge pressure" on ministers to talk up the economy. But he warned that ministers risked getting into "very dangerous territory" if they strayed too far ahead of events in the real economy. "The recession now has only just begun and recovery is very unlikely before the end of 2009," he told the BBC. "It is extremely premature to use a phrase like that." Liberal Democrat Treasury spokesman Vince Cable said recovery was still "sadly a long way off". "Baroness Vadera is clearly living in a parallel universe if she thinks the economy is beginning to recover," he said. "Ministers shouldn't talk down the economy, but Vadera's comments are a work of fiction." 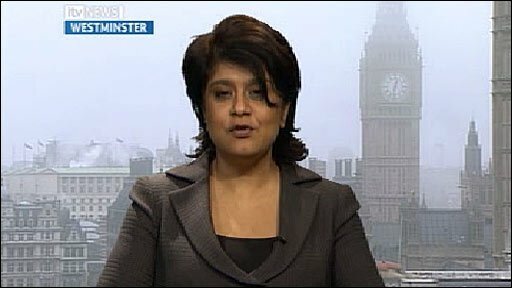 A Downing Street spokesman said Baroness Vadera - a former investment banker and government adviser who became a minister in 2007 - had been "underlining that there is a great deal of uncertainty in the economy at the moment". He added it was not his role to give a "detailed view" on the "green shoots" comments. The spokesman also said: "But these are uncertain economic times. There are pressures on jobs and businesses and families. At the same time you are seeing some businesses that are expanding their workforces." Earlier, in a debate in the House of Lords, Business Secretary Lord Mandelson said he believed the UK was "some way from the end of the road" in dealing with the economic fallout from the banking crisis.